#1 Most Innovative Sprinkler for Watering Vegetables and Herb Gardens, Sprinkling Flowers, Lawn Irrigation & Landscape Gardening! 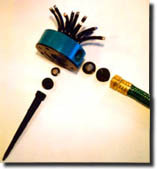 The versatile Noodlehead Lawn & Garden Sprinkler includes one spike, two plugs, and two filter washers! 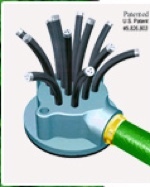 It connects to either an in-ground system or to a standard garden hose. One Noodlehead will cover 400 square feet at 45 PSI water pressure. 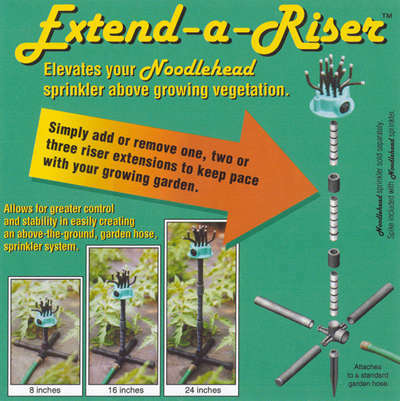 Each Extend-a-Riser will adjust to three different heights; 8" to 16" to 24"
Adapts as your garden grows. Elevates the Noodlehead above obstructions or vegetation. Attaches to a standard garden hose. Gives the hose-end market the option of creating their very own “above-the-ground’ sprinkler system, complete with risers. Simply adjust the Extend-a-Riser as your garden grows for the most efficient watering. Order the combo set and save. 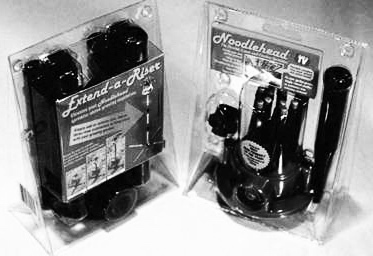 Install between the Noodlehead and your existing in-ground irrigation system risers to control water volume. All deliveries via U.S. Mail unless otherwise requested. Alternate & Priority shipping is available. Please call. For shipping to all locations outside the U.S. extra shipping charges will be included. We will contact you via email or phone to confirm additional shipping costs. Copyright © 2016 Noodlehead Sprinkler. All Rights Reserved.